- Neutron: A neutron is a subatomic patticle contained in the atomic nucleus. It has no electric charge. The number of neutrons in an atomic nucleus determines the isotope of that element. - Proton: A proton is a subatomic particle contained in the atomic nucleus. It has electric positive charge. The number of protons in an atomic nucleus determines the atomic number of that element and its nature. - Electron: An electron is a subatomic particle found in the shell of an atom. It has electric negative charge. The number of electrons in an atom nucleus must equal the number of protons in the nucleus. 4.1a - Dalton: Dalton proposed that all matter is made of atoms and that these atoms cannot be broken into smaller particles. ​4.1b - Thomson: Thompson came up with the "plum pudding model" for the atom. He was the first scientist to propose that the atom was not the smallest particle but in fact contained small negative particles called electrons. He proposed that these electrons sat in a positive jelly like plums in a plum pudding. ​4.1c - Rutherford: Ernest Rutherford fired alpha particles (tiny positively charged particles) at a thin sheet of gold foil and found out that although most alpha particles went straight through the sheet, some were deflected or even reflected back towards their source. Most alpha particles went straight through the gold sheet with little or no deflection. A very small percentage of alpha particles were deflected to a large extent and even reflected back. That at the centre of the atom is a very small, dense region of positive charge that caused occasional deflection and even reflection. He called this the nucleus. Electrons must be moving freely in the empty space around the nucleus. Classical physics suggested the electrons would lose energy as they moved freely around the nucleus and therefore should spiral into the nucleus. This model could not explain the lines found in atomic structure. 4.1d - Bohr: Neils Bohr used evidence from atomic absorption and emission spectra to suggest a more detailed structure of the atom. Passing normal white light through a prism (refraction) shows the full range of colours that it contains it a continuous spectrum. If a gas is excited, electrons can jump up to a higher energy level (by absorbing energy) and then release that same amount of energy when they drop back down. Passing this light through a prism shows only the frequencies of light that are released by the drops. We call this an emmision spectrum. If, instead of exciting the gas, we shine white light through it then we see the opposite. We can see black lines where specific frequencies of light are being absorbed by electrons that are jumping up to higher energy levels. These are called absorption spectra. ​A photo of the emission spectrum of neon using a mobile phone and a diffraction grating. The continuous spectrum of white light using a mobile phone and diffraction grating. How did he use information from atomic spectra? As these lines are only found at specific frequencies, it seems logical that they are produced by jumps or drops between specific energy levels. Therefore, not all energies are allowed. The 3 postulates of Bohr’s atomic model. Electrons orbit around the nucleus without losing energy. Only some orbits are permitted. Electrons change of orbit by absorbing or emitting the difference of energy between the initial and final level. This process can be used to determine the composition of stars that are many light years away as each element has a unique emission and absorption spectrum. 1. State the 3 postulates (conclusions) of Bohr´s model. 2. Describe the results of Rutherford´s model. 3. What is the "plum pudding" model? 4. What was the major difference between Dalton´s proposal and Thomson´s plum pudding model? 5. Why did Rutherford propose that the nucleus was very small? 6. What would be the main difference in atomic spectra given by a very small atom or a very large one? 7. How does Bohr´s model support the existence of atomic emission and absorption spectra? 8. Explain 2 problems with Rutherford´s model. 9. If Rutherford had carried out his experiment and found that all radioactive alpha particles were reflected, what might he have concluded? In 1924, Louis de Broglie suggested that electrons can actually behave like particles and waves - "wave-particle duality". In accordance to wave-particle duality, in 1927, Werner Heisenberg came up with his uncertainty principle. This stated that we cannot know both the position and momentum of an electron at the same time (​click on Walter White for a video on uncertainty). This means that we cannot possibly describe the position of electrons in shells as Bohr suggested because they show an exact orbit where the electrons are. ​Each of the orbitals is capable of containing 2 electrons. Exension reading: One of the problems with Bohr´s atomic model was that the classical model of physics stated that the electron would be pulled into the nucleus. Read the article below to explain why the uncertainty priniple is important in solving this problem..
Read the following Guardian article (Jha, 2013). 2. The first energy level (shell) contains just one s-orbital. Find out which types of orbital are found in the second and third energy level. The Aufbau Principle - We must always fill up from the lowest energy orbitals first with 2 electrons in each. The Pauli Exclusion Principle - 2 electrons in the same orbital must be drawn with opposite spins. Hund´s Rule - For orbitals with an equal energy we must place one electron in each before adding a second electron. Animation on electrons filling in orbitals following aufbau rules. Click here. Download the document below to see examples of electron configurations and how they are written. ​The diagram to the right shows the patterns of how the orbitals are arranged in terms of energy. You will notice that each main energy level has one extra type of orbitals. When these have been written in order then you can see the pattern of the orbital energies. 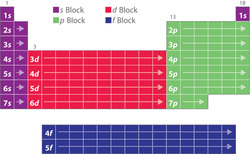 This is an easy way to write the e- configuration for any element in the periodic table! ​b. The shortcut diagram contains orbitals in blue such as g, h and i. How many electrons do you think would be contained in these types of orbital? Extension: Explain when we might find electrons in the g, h and i orbitals and explain why this would be difficult to do. This article may help you - "Are g-orbitals possible?" Rules for filling up the orbitals. Each electron can be individually identified by a set of 4 numbers describing exactly where it is found. These are called quantum numbers. n = Describes the main energy level in which the electron is found. There are 3 types of p-orbital so we name the middle one m = 0. Either side we subtract 1 to give m = -1 or add 1 to give m = 1​. We follow this pattern no matter how many obitals there are. s = This describes the spin of the electron (an arrowing point up or down in our orbital diagram). We represent the spin as s = +1/2 or s = -1/2. It does not matter which we use, as long as we do not label two electons in an orbital with the same spin. <-- This table summarises the possible quantum numbers in the first 4 energy levels. Which quantum number describes the shape of an orbital? Write the set of quantum numbers for the outer electron in H and Na. Write the quantum numbers for each outer electron in carbon and vanadium. Write one possible set of quantum numbers for an electron in a 3d orbital? A 4s orbital? In which orbital is an electron with the quantum numbers n = 4, l = 1, m = -1, s = +1/2? a. How many sets of quantum numbers could be associated with an electron in a 3p orbital? 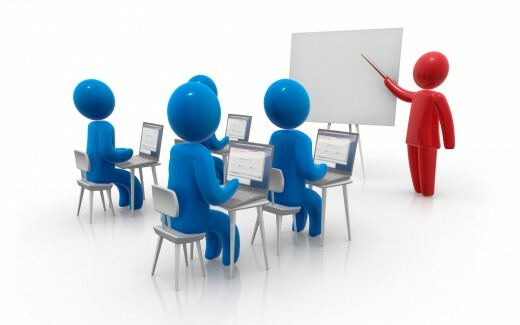 Task 4h: Download this document and complete each slide using any available information. The periodic table is organised by atomic number (the nunber of protons) and also arranged to place elements that share similar chemical properties in similar areas (normally groups(. ﻿Periodicity ﻿is the word used to describe the patterns in the periodic table. We need to know the patterns in atomic radius (the size of atoms), electronegativity, ionisation energy and electron affinity. Down a group - The atomic radius increases as there are more electrons, so more shells and more shielding from the nuclear charge..
Across a period - The atomic radius decreases as there are more protons (positive charge) in the nucleus but the electrons are all in the same shell so they have no extra shielding. The increase in positive charge means the outer electrons are pull more strongly into the nucleus..
Electronegativity is the ability of an atom to attract a bonding pair of electrons. (We measure it using the Pauling scale. In this scale fluorine (the most electronegative element) is assigned a value of 4.0, and values range down to caesium and francium which are the least electronegative at 0.7). Down a group - The electronegativity decreases (as the bonding electrons feel less pull from the nucleus due to increased atomic radius and more shielding from the nuclear charge.). Across a period - The electronegativity increases (as the bonding electrons are closer to the nucleus and feels more pull towards the nucleus). The energy required to do this is called the ionisation energy. If an element has a high electronegativity value, this means there is a strong attraction between the nucleus and the surrounding electrons. We see a strong correlation between the electronegativity values and the first ionisation energies because if an element pulls more strongly on their electrons, it will require more energy to remove them. Because of the attraction between the positive nucleus and negative electron, this process releases energy. 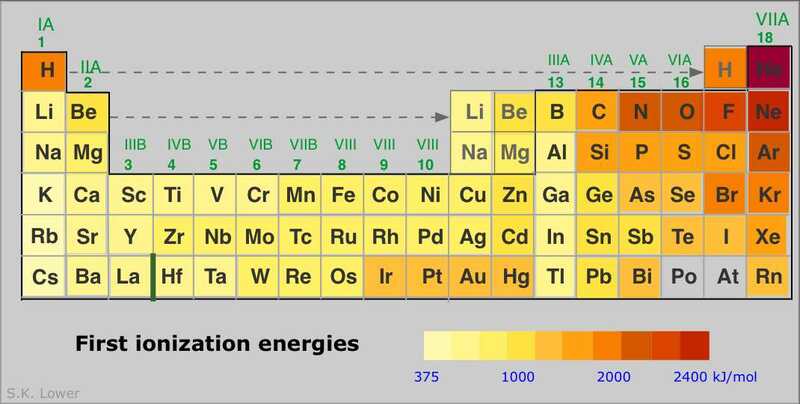 As with ionisation energies, the most electronegative elements have the strongest attraction on electrons and release more energy when they gain one. Note: The correlation is more complicated than the others but you only need to know the general trends. How is electronegativity related to types of bonding? 2 atoms are equally electronegative and therefore both have the same tendency to attract the bonding pair of electrons. This means they would share the electrons. Normally we say a compound contains covalent bonding if the difference in electronegativity is less than 1.8. If 2 atoms have equal electronegativity then we would describe the bonding as pure covalent bonding and if there is a small difference then we would call it a polar covalent bond. E.g. Cl2 and CH4. 2 atoms are have a large difference (more than 1.8) in electronegativity. This means that 1 atom would completely remove an electron from the other. E.g LiCl. We have only metal atoms present. One atom completely removes one or more electrons from another to form charged ions with full outer shells. The actual ionic bond is the electrostatic attraction between the positive and negative charges. Properties - High melting and boiling points; dissolve in water but not organic solvents; and conduct electricity when dissolved in water but not when solid. Atoms share electrons to complete their outer shell. The actual covalent bond is due to the attraction between the pair of shared electrons and the 2 nuclei. Properties - Low melting and boiling points; do not dissolve in water but DO dissolve in organic solvents; and do not conduct electricity. Molecules that contain covalent bonds between atoms in each molecule but only intermolecular forces between molecules. Structures where every atom in the structure is covalently bonded to another atoms. 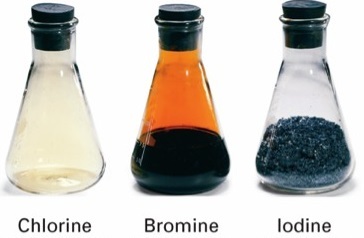 Properties - Low melting and boiling points; do not dissolve in water but DO dissolve in organic solvents (like acetone); and do not conduct electricity. 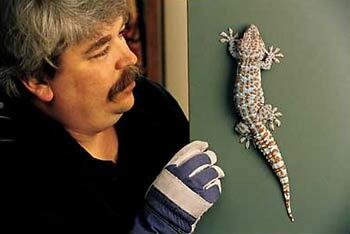 Properties - VERY high melting points; do not dissolve in water or organic solvents (like acetone). Why such high melting points? This is because melting a giant covalent structure would require breaking all the strong covalent bonds. Metal atoms lose their outer electrons to form a structure of positive metal ions and a sea of delocalised electrons. The metallic bond is the strong attraction between the metal ions and the electrons. Properties - Very high melting and boiling points; do not dissolve in water or in organic solvents; and do conduct electricity. The ability of electrons to move freely also means that it is an excellent conductor of heat! 1. A substance has a low melting point and dissolves in organic solvents. What type of bonding is it likely to have? 2. Why do ionic compounds conduct electricity when dissolved in water but not when solid? 3. a. Why do we make frying pans using metallic substances? b. Why don´t we use simple covalent substances to make frying pans? 4. Diamond (above left) and graphite (left) are both giant covalent structures made only of carbon. Why is diamond one of the hardest substances we know yet graphite can be used in pencils? 5. Why is the radius of an Mg2+ ion considerably smaller than a Mg atom? 6. 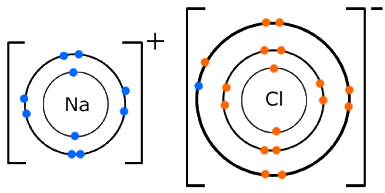 Compare and explain the radius of a Cl atoms and a Cl- ion. Task 4j: Create an infographic on the types of bonding and the properties associated with each one. Extension: Explain why are the electronegativity values of the noble gases usually ignored? If we look closely at the H2O molecules in a glass of water you might notice that although we can see the oxygen and hydrogen atoms bonded together, we cannot see anything between the different molecules. So why do the water molecules stay together in the glass? You will find the answer in the following section. These can "induce" (cause) a temporary dipole in another molecule. The 2 temporary dipoles attract for a very short period of time..
Polar molecules (with a permanent dipole due to a difference in electronegativity) have permanent attractions between the positive and negative poles. Occur in all polar molecules. These are very polar molecules (as the O, N or F are very electronegative) that also have at least 1 lone pair of electrons. The hydrogen on one molecule forms a very strong attraction to a lone pair on another molecule. Occurs in any molecule with hydrogen bonded to an O,N or F.
1. Which types of IMF´s are found in CH4, H2O, HCl and Br2? 2. Why do we represent IMF´s as dotted lines and not solid lines? 3. HCl and Ar are similar sizes but HCl has a much higher boiling point. Explain why? 4. 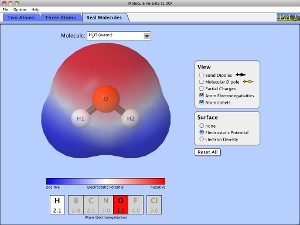 Use the polarity simulation to the left to explain why boron trifluoride (BF3), carbon tetrafluoromethane (CF4) and carbon dioxide (CO2) are not described as polar molecule. Why are we interested in IMF´s? 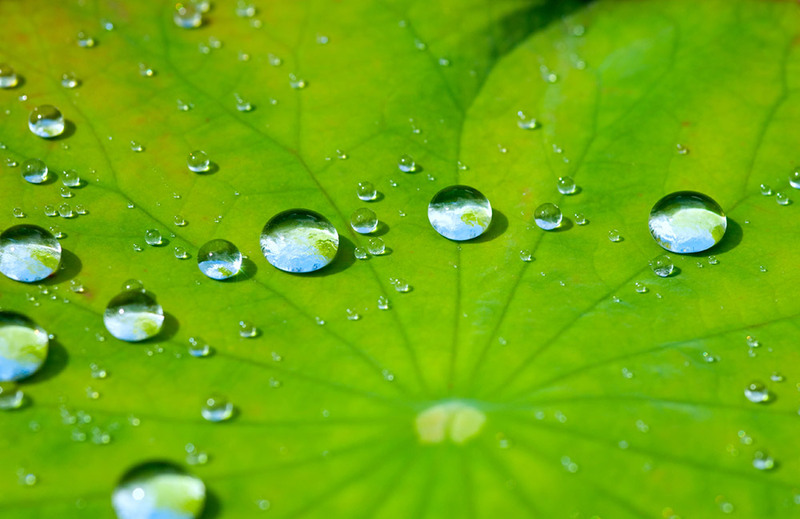 Intermolecular forces can be used to explain many physical properties - melting and boiling points, surface tension, evaporation rate, viscosity and vapor pressure. 1. A substance with strong intermolecular forces will have a higher melting and boiling point as the molecules will require more energy to overcome the IMF´s when becoming a liquid or a gas. Both lines represent similar chemical substances however both H2O and HF do not follow the trend as they both have hydrogen bonding which means far more energy is required to change them into a gas. The following molecules on each line then increase in boiling point as their size (mass) increases. A larger molecule will have stronger Van der Waals forces and therefore require more energy to separate them. Technology is constantly limited by the tools and materials that we have at our disposal. 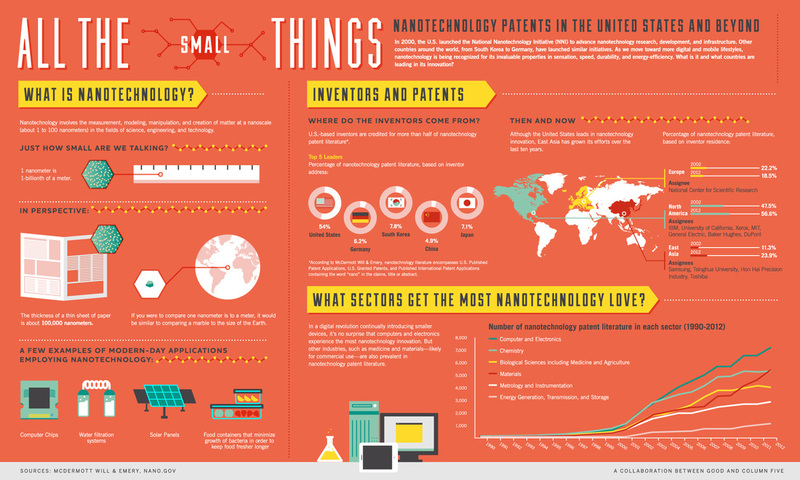 Recent discoveries and advancements in the field of nanotechnology have led to the challenge of finding new uses and applications for them. The properties of materials on the nano-scale can be very different to those found on the macro-scale. This opens up a whole new area of research called nanotechnology which could be extremely important in many areas of scientific development. Innovation in the uses of nanomaterials has already lead to discoveries of materials such as graphene - one of the lightest and strongest materials that we know. It also is an excellent conductor of heat and electricity and is very flexible. These kind of applications open up amazing possibilities in fields such as robotics and medicine. The ability to design and build nanorobots has already started a revolution in the way that we view drug delivery systems by using things like nanotubes to deliver drugs to certain parts of the body. Do you think the benefits outweigh the limitations? ​Make an infographic by reflecting on the task statment found on the "Assessments" page. "Progress in robotics requires constant innovation in the engineering of nanomaterials"